I'm up at some ridiculous time, 4:40 am or so. Last night I picked up the breakfast items (egg, jam packet, some bread) and took them to the room, so that I could eat without disturbing anyone. My plan is to be rolling at 5:30 am. But the wind is blowing like hell! It's been blowing since late yesterday, so I know that is something is up. The sky is overcast. Jeez, another curveball in my plans. Over tea I ask him again about the chance of rain and he confirms with another man who's joined us in the lounge. Their consensus: if it hasn't rained by this point in the morning, then it won't, and even if it does rain, it will be a short rain, five or ten minutes. That's it. It's 7:25am, and I'm finally riding. The manager told me to follow the signs to Tafila. He explained that I'll come to a Wadi Hasa in the morning, and that I can find accommodations in Dana, about 80 k away, or push on to Petra. As I pull out of town, I realize that I'm unwilling to take a detour just to get the photo that I failed to get yesterday. It's a late start, and I've got work to do. At 9am, just past the small town of Aina, I start a long, long descent. I keep my hands squeezing the brakes, nervous after yesterday's fall. I'm glad I'm paying attention, because suddenly there is a trench coming up fast in my lane. I cut into the empty oncoming lane and thank my stars I was paying attention. The trench looked to be 8 inches wide and maybe 5 inches deep. At full speed, a bunny-hop might have worked, but at my moderate speed I don't think I could have cleared both wheels. At a minimum, that would have been a flat or two. More likely, rim damage. I guess my descent took about 15 minutes. At 9:20am I start the climb out. Maybe 10 minutes later I spot two Bedouin sitting beside the road and stop to get a photo of the view and perhaps a photo of them. We nod to each other, and I offer them some of the candy that I'm carrying. They accept and allow me to take a picture. We can't communicate, but they seem like very nice men. I ride on. At an intersection I spot a Bedouin woman with two small kids and slow down to give them some candy. They're thrilled by the strange guy on the strange bike. A short while later a pickup truck pulls over in front of me. The driver waves me over and says something about a ride. 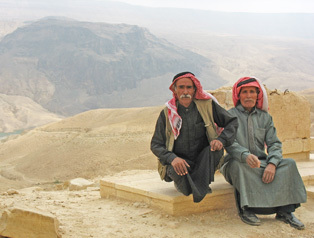 Standing on the back are the two Bedouins that I'd met earlier. They wave me to join them. I'm riding fine, and have no need for the lift, but I like the weirdness of suddenly rejoining my buddies in the back of a pickup. The driver says something about Shaubak and I agree. I toss the bike in the back, tie it off so that it doesn't crush us, and we're off. I check the time - it's around 10am. I snap a few shots in the back, we stop and add a third passenger, and at Tafila the three of them jump out. Now it dawns on me that I'm riding when I don't need to or really want to. Dana was an easy destination and I have the time available. It's true that we are climbing, albeit gently, but I have mixed feelings about this ride. The driver stops at the Dana Nature Preserve, overlook and I snap a photo. The view is something. Then we are at Shaubak. They drop me off. It's just past noon. Petra should be about two-hours' ride. 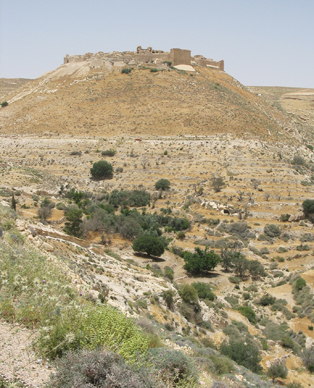 I clearly have time to explore the crusader castle that's somewhere around here. I bicycle up to someone, ask, "Castle?" and am pointed down a hill. Around the bend, I see the castle. It's going to be a drop and a climb, but I rationalize that I just got a ride that I hadn't counted on, and that I need to log some miles! The exterior of the castle looks great. Getting up there, the interior is pretty ragged, similar to Qal' at Shayzar, that "dead city" that I visited back in Syria. Two roads lead away from the castle. I take the known one, the one I came in on. I get back to the main road, and head south. Soon I'm at the town of Shaubak, and I ask how far to Petra. "35 kilometers." Hmmm… My map had me thinking 25 kilometers. It's about 1:15pm. It's somewhat hot, but I've been sitting in the back of a pickup for hours, so it's time for me to get back to work. Riding along, I'm thinking that I'm somewhat glad I cheated; there is a side wind from the west that's really serious. The road's nice though, smooth and empty. I'm riding in the mid-afternoon heat, but it's been an easy day and the destination is worthwhile. On the side of the road I spot two young boys and their father; I look past them to the field, and see that they are tending camels. I stop and I snap a few pictures. Riding along, I come to another camel herd. 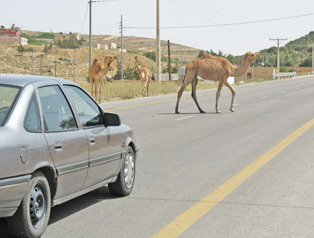 These camels are much more disorderly, and I stop to take a shot of strays slowing down traffic. 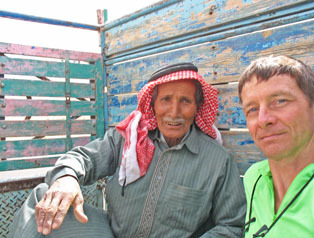 I nod a "hello" to the Bedouins tending the camels, and am invited to join them for tea. "Sure!" For the past month, I've turned down "in-home" offers of chai, because of the drive to keep moving. But I must be close to Petra by now, and I've just been invited to chai by Bedouin camel-herders! It's a special experience. First of all, it's not a tent. I've seen plenty of those, but this man lives in a very respectable concrete home just off the road. I point at the house, successfully indicate that I am very impressed, and somehow convey that I thought Bedouins lived in tents. He laughs, and indicates that he has a tent "out-there" gesturing to the horizon. There are five of us total in this plain but spacious room: the leader, another man, a younger man, and a boy, perhaps 5 years old. The voices of others - women - filter through the wall. A tray with a teapot, bowl of sugar and glasses comes out, and everyone joins in. Then another tray comes out, filled with bread, cheese, tomatoes, olives and cucumber. It's placed between the younger man, and me and I am repeatedly encouraged to eat. I eat lightly, to be polite, but show less inhibition when it comes to refills of the tea. The man next to me eats a fair amount, then shifts back to conversation. The leader asks me if I want more to eat. I indicate that I am full, and thank him for his generosity. Someone picks up the tray, and carries it over to him. He digs in, with relish. Wow. He waited until his guests were full! LP had said something about Bedouin hospitality. Apparently, it's the code of the desert: help others, since someday your own survival might depend on their generosity. I head out to the bike to continue my ride. The man who had also eaten is fascinated by my ensolite sleeping pad. This is a little awkward - it's a little too early for me to be giving away provisions - but after their generosity, I sense that it's proper. I gesture for him to have it, but he loses interest. (Given that it's the same pad I used on the '84 trip, I can't blame him for passing on the offer.) 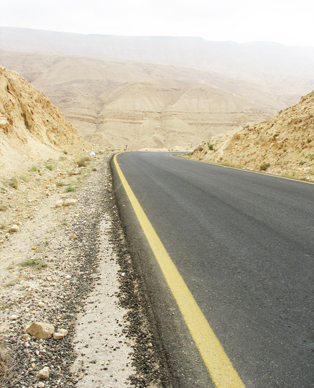 I wave goodbye, and soon enough I'm at a turnoff for Wadi Musa, and the ruins of Petra. With a name incorporating "wadi" I should have guessed what was in store - a nice long downhill into town. I'm not going to want to peddle out when the time comes. I come to the main traffic circle and spot signage for many hotels, including the Lonely Planet-maligned Valentine Inn. I elect to visit Al Anbar Hotel II, but it's full, so I head back to the Valentine. In the lobby, beer cans and whisky bottles displayed everywhere, plus a too-talkative New Yorker smoking a water-pipe. I'm shown a very decent room, but 15JD, not the 8-10JD that Lonely Planet had indicated. It's the concept of the "all you can eat" dinner buffet for 4JD that cinches the deal. I check in. Dinner on the patio is perfect: a wide selection of dishes and nice company. My table has a very nice Italian guy, Gianni, a young Aussie and the over-the-top New Yorker. Unfortunately, every thread of conversation was quickly turned by him into something he's done or somewhere he's been. Oh well. I go to bed at 9pm. Stopping to take a scenic photo, I meet two locals..
A short time later I'm sharing a pickup truck with them! I stop to take a few photos as some camels decide to challenge traffic. 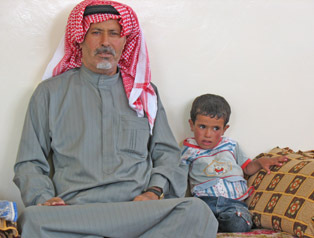 The head of this Bedouin family.